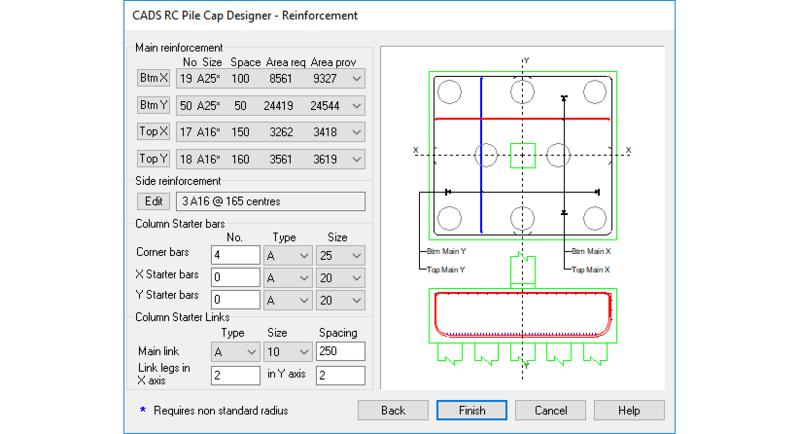 CADS RC Pile Cap Designer automatically produces a selection of suitable designs to BS 8110 and EC2 for pile caps with 2-9 piles supporting circular or rectangular columns. The software offers a range of pile cap group solutions for the input loads. After selection of a pile cap type, the program offers a range of reinforcement solutions with the optimum offered as default. Once the wizard is started the user simply completes each dialog box and selects < next > to move either forwards or < back > to review and/or amend a previous input dialog box. An unlimited number of biaxial load cases and/or support reactions can be imported from frame analysis models such as CADS A3D MAX, allowing users to design groups of pile caps as a single solution. 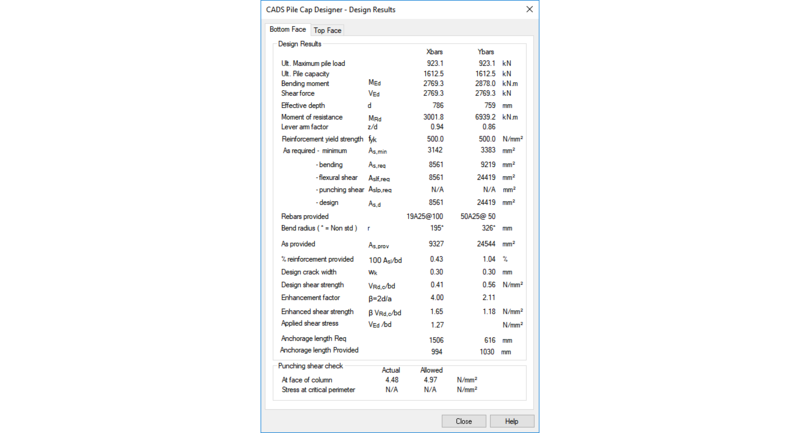 Used in this way users of CADS RC Pile Cap Designer gain from the obvious benefits of data re-use which include significant time savings and the reduction of errors. Users are also able to add additional loads such as those from ground beams, etc. 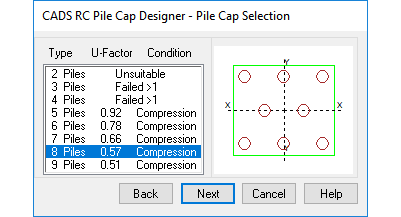 Used stand-alone or as part of the CADS integrated analysis, design and detailing solution, CADS RC Pile Cap Designer automatically produces a selection of suitable designs to BS8110 for pile caps with 2 – 9 piles supporting rectangular or circular columns. The software presents the user with a selection of pile cap types which can be selected on the basis of the percentage pile utilisation factor displayed for each. A range of detailed reinforcement solutions based upon the preferred bar sizes and arrangements specified by the user is calculated automatically. The design can be refined and optimised to meet specific job requirements by using the powerful reinforcement editing checking features. Completed designs can be detailed and scheduled in seconds with the CADS RC Pile Cap Detailer Macro. 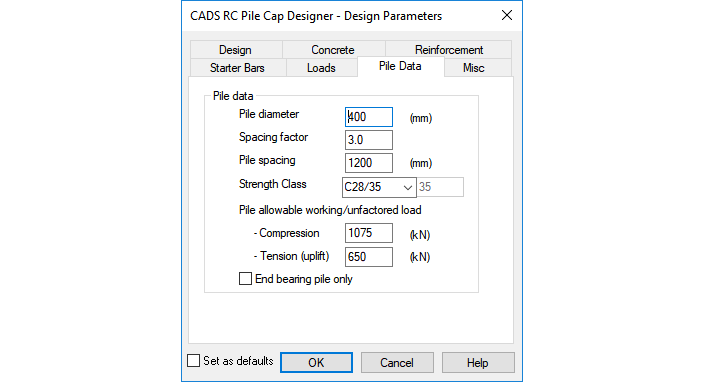 Once the pile cap job has been saved the CADS RC Pile Cap Detailer Macro can read the job file on a network or hard disk drive and can use it to prepare a detailed AutoCAD drawing and bar bending schedule. 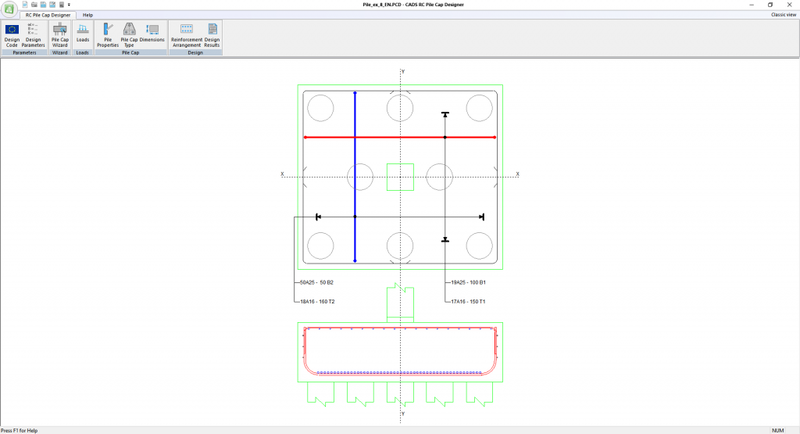 The completed design can be printed onto a single A4 sheet which has been designed to include a detailed reinforcement diagram, together with all the necessary information to allow a quick manual check by a design team manager or checking engineer. Users can configure the printout to include their company’s logo, name and address details together with project header information. Detailed design results can also be exported in the form of a pre-formatted text file. Users of Microsoft Word will be able to create a new document in Microsoft Word. Such a document is easily incorporated into a larger report or set of calculation pages.